Why do some memories last a lifetime while others never persist for more than a few minutes? How are short-term memories converted into long-term memories? Recently, a collaborative study led by Dr. BI Guoqiang at University of Science and Technology of China of Chinese Academy of Sciences and Dr. CHENG Heping at Peking University (PKU) revealed the essential role of dendritic mitochondrial flash in transforming short-term synaptic plasticity into long-term plasticity, which is known to be the cellular correlate of long-term memory. The results were published in Nature Communications. Mitochondrial flash or 'mitoflash' was first identified by Dr. CHENG Heping's team at PKU as a quantized signal at the single-mitochondrion level, involving mitochondrial events such as membrane depolarization, reactive oxygen species (ROS) production, and matrix alkalization that last for tens of seconds. Despite its energy consumption and risky ROS component, mitoflash has been found to exist in functional mitochondria throughout cell types and species. Dr. CHENG and Dr. WANG Xianhua's team have been pursuing the biological relevance of mitoflash for years. Synaptic plasticity is regarded as the cellular basis of learning and memory. Induced by different patterns of neuronal activities, short-term synaptic plasticity lasts for few seconds to a few minutes, whereas long-term plasticity lasts for tens of minutes to hours and even longer period of time. 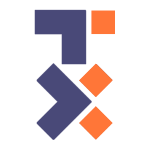 The joint research team hypothesized that mitoflash might be involved in signaling transduction of synaptic plasticity. To test this hypothesis, doctoral students examined rat hippocampal neurons to study learning and memory, and employed a set of novel methods including long-term continuous imaging of mitoflashes and photon-activation of individual mitoflash events by femtosecond laser pulses. With these new methods, researchers found that synaptic long-term potentiation (LTP) was always accompanied by one or more mitoflashes in nearby dendritic mitochondria after chemical, electrical or glutamate uncaging induced LTP . Furthermore, artificially induced mitoflashes could, in turn, facilitate transition from short-term synaptic potentiation to long-term potentiation. Intriguingly, the regulatory effect of mitoflash on synaptic plasticity was only effective within the critical time window of 30 minutes and a spatial extent of about 2 μm, demonstrating the spatiotemporal precision of this regulatory mechanism. 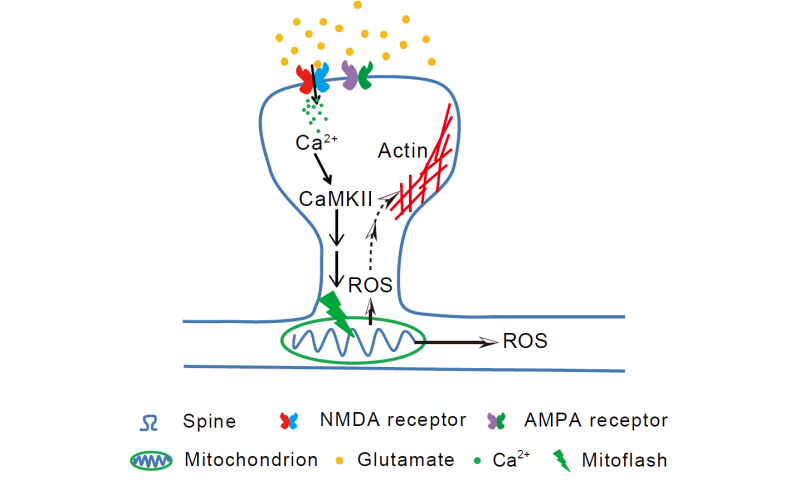 Further study revealed that synaptic calcium and calcium-calmodulin kinase was important for eliciting mitoflash, which in turn released ROS to signal long-term synaptic plasticity. This study identified mitoflashes as digital bio-signals playing essential roles in synaptic plasticity. It revealed for the first time the bi-directional interaction between dendritic mitochondria and synapses, and indicated that local and transient ROS burst may provide a subcellular mechanism for "burning" short-term synaptic changes into long-term memory, which provided novel insight into the biological relevance of mitoflash.